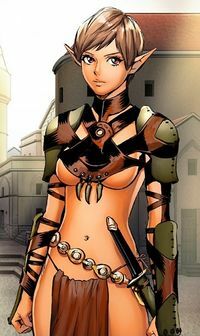 As one of two characters representing the player, Elenor's personality is rather malleable. During certain conversations, she has the option of a Joking, Tender, or Forceful answer. If one trait becomes dominant, then her outlook is flavored by this decision. A Joking personality sees the humor in a situation, Tender will try to reach their aims peacefully, while a Forceful Elenor thinks she can physically dominate any situation. Elenor is extremely loyal to the Amazons in particular, and her Mistresses in particular, current and past ones. Elenor, an elf who at a young age traded her freedom for protection. Elenor had been separated from her tribe by marauding orcs. Elenor is chaste, even if she served in the Queen's harem. (Revealed in a Chambara dialogue). Elenor's history is more malleable than other characters. At the start, the player will have certain choices which effects Elenor's background, as well as some future dialogues. These choices are reflective if you picked a Warrior background. The Thief background is essentially the same except in a few key areas. The first choice, dictates where Elenor currently serves the Amazons. Highlights Elenor's exploits in the current year's Provings. Elenor crafts a gift for her mistress. Elenor's previous mistress dies, and leaves a gift for her. Another slave approaches Elenor, trying to convince her to leave. This page was last modified on 23 March 2014, at 20:11.